For more information about Novo Kasatria, contact Mike Burns: mikeburns(AT)myplace.net.au, 02 4962 3603 or 0432 219 133. The forthcoming performance at Lake Macquarie Art Gallery follows up the tremendous energy generated by the Australian Gathering Of Gamelans at the recent Woodford Folk Festival. Novo Kasatria were joined by special guests Wahyu Roche and Kym Hall, who have been touring NSW and Queensland for some months, performing in Sydney, Woodford, Gosford, Byron Bay and Armidale. The repertoire features some outdoor Angklung Banyuwangi, a spectacular gong, chime and bamboo ensemble, and drum ensembles (Rampak Kendang); and quieter indoor pieces on kacapi suling (Sundanese Zither and Flute), and our own fusion pieces involving the preceding with harp, violin, guitar and mandolin. 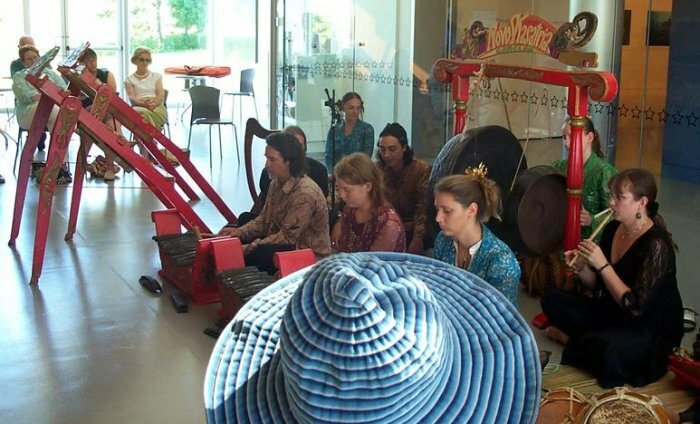 Gamelan is an ancient musical orchestra of gongs, chimes, drums and many other instruments. Its name suggests striking or handling instruments, and its music varies from wild trance dances and drama action pieces to quiet meditative pieces encouraging a dignified restraint (regu ). 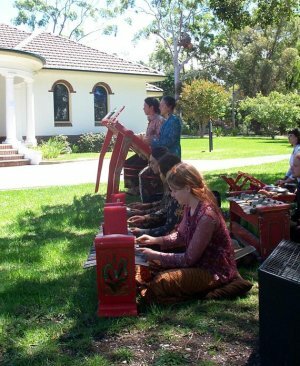 In addition to traditional pieces Novo Kasatria (the name suggests new age warriors) will be developing new pieces and styles not already covered by the twenty or so gamelan groups across Australia. The tradition of Angklung Banyuwangi, while not as ancient as the classic Javanese, Balinese and Cirebon orchestras, has evolved out of unique local traditions over two or three hundred years. Banyuwangi is the easternmost town of Java, looking over the strait to Bali, less than half an hour on sea. It has blended local (Osing) songs with Balinese and East Javanese gamelan practice, to become a brilliant and high spirited show. Angklung Caruk is a local competition, where two angklung groups compete for crowd approval over an afternoon, playing tunes of many styles, showing off virtuosic variations, and comic spots. A full ensemble would also have 2 peking (high 10 keyed saron), 2 demung and a second slentem. The pieces played in this group have been learned from the groups of Mitro and Misnadi, in Rogojampi and Glendeng, Banyuwangi province.